I am thrilled to have the wonderful Kirsten McKenzie visiting my blog today. This is a fantastic blog, which has winged its way through the email ether from the distant shores of New Zealand. 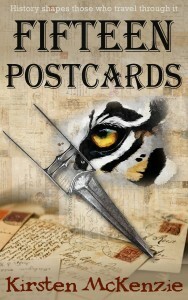 My first book has just been published by Accent Press – ‘Fifteen Postcards’. A novel traversing three continents and two centuries. A blend of ‘The Far Pavilions’, with a touch of ‘The Time Travelers Wife’, rolled together with a smidgeon of the ‘Antique’s Roadshow’. If it wasn’t for my father dying, it would never have been written. I had a pretty standard upbringing in New Zealand in the 70s. Dad had his own business – an antique shop, and worked long hours. Mum raised my younger brother and I. 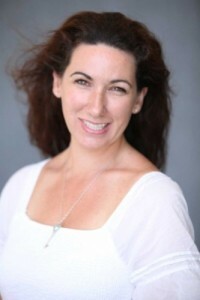 She was the one who went on all the school trips, picked us up after school, and took us to our after school activities. In the school holidays, my ideal day was helping Dad at the shop, Antique Alley – a literal treasure trove, and described as an Auckland icon. A shop heaving with stock, which invariably overflowed onto the floor, and filled the corridors, very much like how I described ‘The Old Curiosity Shop’ in ‘Fifteen Postcards’. Initially I was allowed to sit in the corner and sell postcards. As I got older I was promoted to serving behind the counter, helping customers choose gold bracelets for gifts, or give advice about which dinner service looked better. I worked off and on at the shop, and at antique fairs up and down the country, right through school and university. By osmosis I picked up a small amount of knowledge about a lot of things. Then in 2005 Dad died. My brother and I both quit our jobs (I was a Customs Officer), and started working at the shop. Ostensibly to provide our mother with an income, but it was also a job I had once loved, and although I’d never pursued it, I was more than happy to stand behind the shop counter and carry on where I’d left off in my late teens. Working at the shop was a way to reconnect with my father. Antique Alley was such a part of his personality that walking into the shop became a way to keep his memory alive. Even today, nine years after his death, when I unlock the front door, and close the world off behind me as I sprint inside to turn off the alarm, I’ll murmur “Hello Dad”. Often followed by a little “Let this be a good day Dad!”. That may make me sound slightly nutty, but it gives me a sense of connectivity with my father, whom I miss everyday. Writing ‘Fifteen Postcards’ in 2013 was part homage to my father, and part the realisation of a long held desire to write a book. Scattered throughout the book are snippets of his life and his quirks. My parents really did live above the shop before I came onto the scene, just like ‘Sarah’s parents in the book. My grandmother papered the lounge room upstairs in an appalling mixture of prints and floral paper (as described in the book), which Mum still detests to this day (there’s so much stock in that room now that it would be a marathon effort to strip it all back!). It was amusing remembering all of Dad’s foibles and fantastic sayings, weaving them into a plot worthy of his knowledge and expertise in the antique industry. It also became abundantly clear that my ‘small amount of knowledge about a lot of things’ wasn’t at all sufficient for a historical fiction novel, but that’s the basis of another blog post! They say finding a publisher is one of the hardest parts of writing a book. I had rejections, five to be precise, but one of the publishers I submitted to, Accent Press, offered me a publishing contract. Which I signed. Why did I submit my manuscript to them? That was partly to do with Dad. He was born in Wales, moving to New Zealand when he was three. As an adult he returned to Wales to work and to reconnect with his extended family. I like to think Dad had a small part to play in me choosing Accent Press, who are based in Wales, and in them choosing me. This is where it starts getting slightly more ‘Twilight Zone’. Bear with me as I talk you through it… David Powell was the incredible editor who worked on ‘Fifteen Postcards’. Without him, my book wouldn’t be anywhere near as awesome as it is. Weirdly, my father’s name was David. Fate? Coincidence? It keeps going. Accent Press released my book on the 21st of May, Mum’s birthday. Yes, yes, a strange collection of coincidences, but as someone still living with the grief of losing my father unexpectedly, these coincidences have given me some measure of solace, a belief that there has been a higher power at work, helping and guiding me. I am in the wonderful position of loving my job, as my father did, selling other people’s treasures. Everything in the shop was once loved and desired, all just waiting for their new home. It’s the ultimate in recycling. But isn’t that what writing is? The recycling of memories? 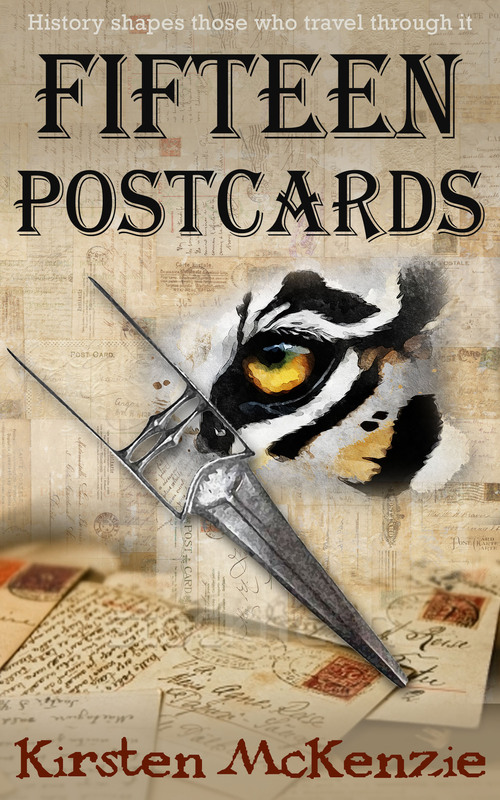 The writing of ‘Fifteen Postcards’ has captured some of my memories, hidden amongst the fictional plot and a cast of nefarious characters. And for that I am truly grateful to the hand of fate, or the confluence of coincidences.